FALLS CHURCH, Va. – Jan. 28, 2016 – Northrop Grumman Corporation (NYSE:NOC) reported fourth quarter 2015 net earnings decreased to $459 million, or $2.49 per diluted share, from $506 million, or $2.48 per diluted share in the fourth quarter of 2014. Fourth quarter 2015 diluted earnings per share are based on 184.2 million weighted average shares outstanding compared with 204.2 million shares in the prior year period. The company repurchased 1.6 million shares of its common stock for $283 million in the fourth quarter of 2015. As a result of the passage of the Protecting Americans from Tax Hikes Act of 2015, which made permanent research and development tax credits, the company recognized a full year credit of $60 million, or $0.33 per diluted share, in the fourth quarter of 2015. For 2015, net earnings totaled $2.0 billion, or $10.39 per diluted share, compared to $2.1 billion, or $9.75 per diluted share in 2014. Diluted earnings per share for 2015 increased 7 percent and are based on 191.6 million weighted average shares outstanding compared with 212.1 million shares in 2014. During 2015, the company repurchased 19.3 million shares of its common stock for $3.2 billion. As of Dec. 31, 2015, $4.3 billion remained on the company's share repurchase authorization. "I want to congratulate our team on another outstanding year of strong performance. We look forward to building on this year's successes as we continue our focus on performance, portfolio and capital deployment and take on new opportunities in 2016," said Wes Bush, chairman, chief executive officer and president. Fourth quarter 2015 segment operating income decreased to $717 million, and segment operating margin rate increased 20 basis points to 12.6 percent. Operating income decreased 10 percent and operating margin rate decreased 40 basis points to 12.1 percent. For 2015, segment operating income decreased to $2.9 billion, principally due to lower sales and $75 million realized in 2014 for settlements of certain legal claims. Operating income for 2015 totaled $3.1 billion and operating margin rate was 13.1 percent. Total backlog as of Dec. 31, 2015, was $35.9 billion compared with $38.2 billion as of Dec. 31, 2014. Fourth quarter 2015 new awards totaled $5.8 billion, and new awards for 2015 totaled $21.3 billion. On Oct. 27, 2015, the U.S. Air Force announced it was awarding the company a contract for engineering and manufacturing development and early production for the Long Range Strike Bomber (LRS-B). In Nov. 2015, the unsuccessful offeror filed a protest asking the U.S. Government Accountability Office to review the decision to award the company the LRS-B contract, triggering an automatic stay of performance of the contract. As a result, the LRS-B award is not included in 2015 new awards or backlog. Fourth quarter 2015 cash provided by operating activities totaled $1.6 billion and free cash flow totaled $1.5 billion. The increases in cash from operations and free cash flow from the prior year period are principally due to lower cash taxes. The company's 2016 financial guidance is based on the spending levels provided for in the Bipartisan Budget Act of 2015 and the Consolidated Appropriations Act of 2016. The guidance assumes no disruption or cancellation of any of our significant programs and no disruption or shutdown of government operations. Guidance for 2016 also assumes adequate appropriations and funding for the company's programs in the first quarter of the U.S. government's fiscal year 2017. Estimated capital expenditures in 2016 reflect increased programmatic requirements, including LRS-B, and approximately $300 million for the planned purchase of office buildings currently leased by the new Mission Systems sector. These investments support the company's continued focus on cost reduction, affordability and competitiveness. Fourth quarter 2015 operating income decreased 10 percent due to lower segment operating income and higher unallocated corporate expense, which more than offset higher net FAS/CAS pension adjustment. Lower segment operating income reflects lower sales, partially offset by improved performance in Information Systems. Unallocated corporate expense increased $48 million. As previously announced, in the fourth quarter the Internal Revenue Service accepted the company's adoption of a tax method change. This and other state tax items increased fourth quarter 2015 unallocated corporate expense by $26 million. For 2015, operating income decreased 4 percent due to lower segment operating income, and higher corporate unallocated expenses, which more than offset higher net FAS/CAS pension adjustment. Segment operating income in 2014 benefited from $75 million in settlements and a benefit of approximately $45 million from lower CAS costs due to passage of the Highway and Transportation Funding Act of 2014. For the fourth quarter of 2015, federal and foreign income tax expense declined to $162 million from $195 million in 2014, and the company's effective tax rate decreased to 26.1 percent from 27.8 percent in 2014. For 2015, federal and foreign income tax expense declined to $800 million from $868 million in 2014, and the company's effective tax rate declined to 28.7 percent from 29.6 percent. The company's lower effective tax rate for 2015 includes a $76 million increase in research credits primarily resulting from additional credits claimed on our prior year tax returns, partially offset by a $51 million benefit in 2014 for the partial resolution of the IRS examination of 2007-2009 tax returns. Aerospace Systems fourth quarter 2015 sales decreased 4 percent due to lower volume for space and restricted programs, partially offset by higher volume for unmanned programs. The decrease in space is primarily due to lower volume for the Advanced EHF program. Sales in 2015 were comparable to 2014 sales. Excluding settlements of $75 million in 2014, sales increased 1 percent due to higher volume across a number of programs. The increase in unmanned sales includes higher volume for Global Hawk and other programs. Military aircraft sales for 2015 include higher volume for the E-2D and F-35 programs, partially offset by lower volume for the F/A-18 as that program ramps down. Space sales for 2015 include higher volume for restricted programs, partially offset by lower volume for the Advanced EHF program. Aerospace Systems fourth quarter 2015 operating income decreased 6 percent and operating margin rate decreased to 11.5 percent, reflecting lower sales and less favorable performance for unmanned programs, partially offset by improved performance for military aircraft programs. For 2015, operating income declined 7 percent and operating margin rate declined to 12.2 percent principally due to $75 million realized in 2014 for settlements of certain legal claims. Electronic Systems fourth quarter 2015 sales decreased 7 percent, due to lower volume and deliveries for airborne ISR and targeting, navigation and maritime systems, and space programs, as well as the impact of cost reduction initiatives. Declines in these programs were partially offset by higher volume for land and self-protection systems. For 2015, sales declined 2 percent due to lower volume for airborne ISR and targeting programs and lower volume for land and self-protection programs due to in-theater force reductions. These impacts were partially offset by higher volume for navigation and maritime systems programs. Electronic Systems fourth quarter 2015 operating income declined 11 percent and operating margin rate was 16.4 percent. Lower operating income and margin rate reflect lower volume described above and a business mix that includes lower volume for mature fixed price production programs. For 2015, operating income declined 7 percent and operating margin rate was 15.6 percent. Lower operating income and margin rate are primarily due to lower volume, a change in business mix that includes lower volume for mature fixed price programs, as well as less favorable performance in airborne ISR and targeting and land and self-protection programs. Information Systems fourth quarter 2015 sales decreased 13 percent, due to fewer days in this year's fourth quarter and lower material sales than in the prior year period. For 2015, sales decreased 5 percent, primarily due to lower volume for command and control and civil programs. Lower sales for command and control programs includes lower volume for CANES, the impact of in-theater force reductions and completion of the Ground Combat Vehicle contract. Lower sales for civil programs is primarily due to the restructuring of the Emergency Communications Transformation Program Stage II contract. Information Systems fourth quarter 2015 operating income increased 5 percent, and operating margin rate increased 200 basis points to 11.3 percent. For 2015, operating income increased 1 percent and operating margin rate increased 70 basis points to 10.5 percent. Higher operating income and margin rates in both periods reflect improved performance, a reduction in lower margin material sales and the impact of cost reduction initiatives, which more than offset lower sales. Technical Services fourth quarter 2015 sales decreased 4 percent primarily due to lower volume for integrated logistics and modernization programs, including the ICBM program. For 2015, sales increased 1 percent due to higher volume for mission systems and readiness programs, primarily due to higher volume for an international program, partially offset by lower volume for integrated logistics and modernization programs, principally the ICBM program. Technical Services fourth quarter 2015 operating income decreased $4 million and operating margin rate decreased to 8.4 percent. Lower operating income is primarily due to lower volume in the period. For 2015, operating income decreased 3 percent and operating margin rate declined to 8.9 percent. Lower operating income and operating margin rate were due to lower income from an unconsolidated joint venture than in 2014, partially offset by higher sales volume. Northrop Grumman will webcast its earnings conference call at noon Eastern time on Jan 28, 2016. 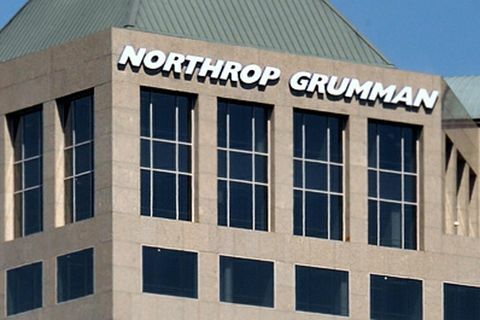 A live audio broadcast of the conference call will be available on the investor relations page of the company's website at www.northropgrumman.com . This press release and the information we are incorporating by reference contain statements, other than statements of historical fact, that constitute "forward-looking statements" within the meaning of the Private Securities Litigation Reform Act of 1995. Words such as "expect," "intend," "may," "could," "plan," "project," "forecast," "believe," "estimate," "guidance," "outlook," "anticipate," "trends," "goals," and similar expressions generally identify these forward-looking statements. Additional information regarding these risks and other important factors can be found in the section entitled "Risk Factors" in our 2015 Annual Report on Form 10-K and as disclosed in this report and from time to time in our other filings with the SEC. You are urged to consider the limitations on, and risks associated with, forward-looking statements and not unduly rely on the accuracy of forward-looking statements. These forward-looking statements speak only as of the date this report is first filed or, in the case of any document incorporated by reference, the date of that document. We undertake no obligation to publicly update or revise any forward-looking statements, whether as a result of new information, future events or otherwise, except as required by applicable law. This release and the attachments also contain non-GAAP financial measures. A reconciliation to the nearest GAAP measure and a discussion of the company's use of these measures are included in this release or the attachments. New Awards — The estimated value of contract awards recorded during the three and twelve months ended Dec. 31, 2015 was $5.8 billion and $21.3 billion, respectively. On Oct. 27, 2015, the U.S. Air Force announced it was awarding the company a contract for engineering and manufacturing development and early production for the Long Range Strike Bomber (LRS-B). In November 2015, the unsuccessful offeror filed a protest asking the U.S. Government Accountability Office (GAO) to review the decision to award the company the LRS-B contract, triggering an automatic stay of performance of the contract. As a result, the LRS-B award is not included in 2015 new awards or backlog. Cash provided by operating activities before after-tax discretionary pension contributions: Cash provided by operating activities before the after-tax impact of discretionary pension contributions. Cash provided by operating activities before discretionary pension contributions has been provided for consistency and comparability of financial performance and is reconciled in Table 2. Free cash flow: Net cash provided by operating activities less capital expenditures. We use free cash flow as a key factor in our planning for, and consideration of, strategic acquisitions, stock repurchases and the payment of dividends. This measure should not be considered in isolation, as a measure of residual cash flow available for discretionary purposes, or as an alternative to operating results presented in accordance with GAAP. Free cash flow is reconciled in Table 2. Free cash flow before after-tax discretionary pension contributions: Free cash flow before the after-tax impact of discretionary pension contributions. We use free cash flow before discretionary pension contributions as a key factor in our planning for, and consideration of, strategic acquisitions, stock repurchases and the payment of dividends. This measure should not be considered in isolation, as a measure of residual cash flow available for discretionary purposes, or as an alternative to operating results presented in accordance with GAAP. Free cash flow before discretionary pension contributions is reconciled in Table 2. Net FAS/CAS pension adjustment: The difference between pension expense charged to contracts and included as cost in segment operating income in accordance with U.S. Government Cost Accounting Standards (CAS) and pension expense determined in accordance with FAS (GAAP Financial Accounting Standards). Net FAS/CAS pension adjustment is presented in Table 1. After-tax net pension adjustment per share: The per share impact of the net FAS/CAS pension adjustment as defined above, after tax at the statutory rate of 35 percent, provided for consistency and comparability of financial performance as presented in Table 1. Pension-adjusted operating income: Operating income before the net FAS/CAS pension adjustment as reconciled in Table 1. Management uses pension-adjusted operating income as an internal measure of financial performance.